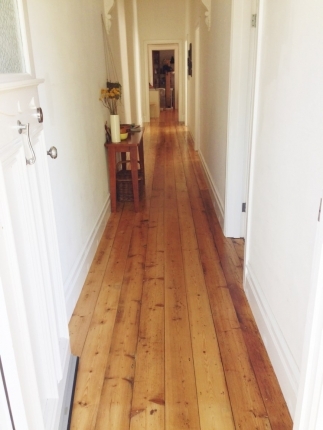 When House Nerd reader Michelle Harmer wrote to me to ask if I had a suggestion for a gorgeous floor runner for the hallway of the 108-year-old Melbourne home she and her husband recently finished renovating, I instantly thought of asking you guys. I learned long ago that House Nerd readers are a savvy switched-on lot! So maybe you can help Michelle out. 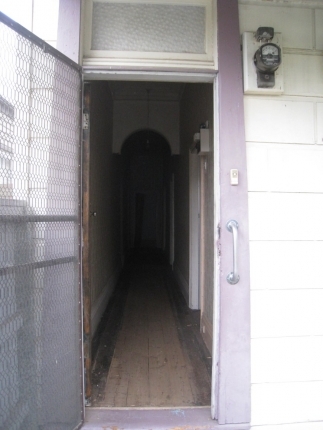 Michelle’s old Melbourne home has a traditional long passageway down one side of the house. Michelle and Matt have renovated it from its original condition . “When it came to the original part of the house, we knocked out the false lowered ceilings and restoring the old ceilings, removed several layers of carpet, vinyl, newspaper, removed wallpaper, paint and restored archways,” says Michelle. We’re eagerly welcoming your suggestions… so if you have any ideas of what kind of rug or floor runner Michelle might like to try, I would love to hear about it! Just leave a comment below. 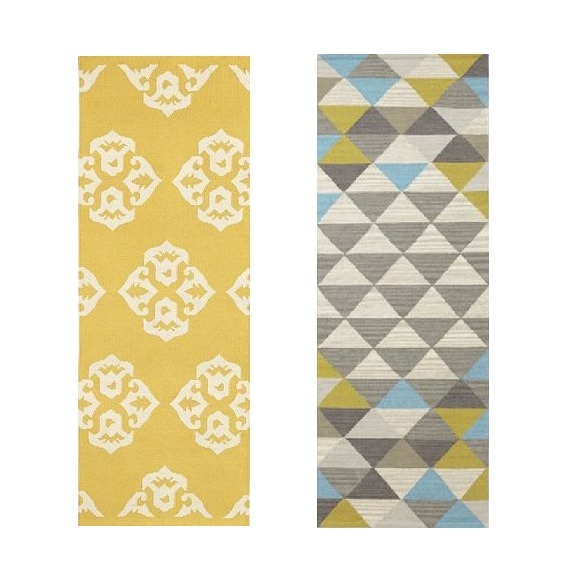 MY SUGGESTIONS: The Andalusia Wool Dhurrie in Horizon and the Sarah Campbell Mosaic Triangles Wool Dhurrie in Wave, both $149 and from West Elm. What a beautiful home Michelle and Matt have and well done doing it yourselves! I am completely in love with Armadillo and Co and their new collection- stunning colours and pattern. I think with children and being a high traffic area it's gotta be something that is forgiving of its harsh habitat. Good luck on your hunt for the perfect rug! I love Armadillo and Co! What a gorgeous, gorgeous home! Well done, Michelle and Matt for sticking to your vision and completing all the hard work! Now, Michelle, quick question: may I ask you why you want a runner? Is that for making the house warmer/insulating it better? Or is it because your hallway looks a little "plain" and impersonal? If it's for the latter, may I suggest, instead of a runner, you decorate your lovely walls? Your floorboards look absolutely amazing, and I think it would be a pity to hide them under a runner (besides, I've tripped so many times on runner when entering a house - and my little girl did too, even with an anti-slip thingy underneath that I'm always a bit cautious with using runners). So, if you don't need a runner for insulation purposes, why not leaving your floorboards as they are and use your hallway space as a gallery, hanging various artwork on the wall? It can be bold and bright drawings/paintings for your child (that you can frame with cheap but effective Ikea Ribba frames), family photos, oversized canvas, vintage prints, or a mix of all of this. I can see you've done a little bit of this, but you can push it much further and add wall art on every wall. Add colour, go for a few large prints/canvas. Mix it up. You'll end up with a fresh, yet elegant, and personal look, and get to see those lovingly restored floor every day. Now, if you really want a runner, I hjighly recommend you to browse www.overstock.com. That's where I get 99% of the rugs for my clients :) Even though you'll have to pay shipping from the US to Asutralia, it is usually way cheaper than buying over here and they have a great range of rugs. Here are a few of my favorites for your home (not too traditional and not too modern...) 1: http://www.overstock.com/Home-Garden/Kaleidoscope-Ivory-and-Multicolored-Area-Rug-27-X-10/8297795/product.html?refccid=7W74MY6ZCWCKXLKFBENU4ZCTQM&searchidx=63 2. http://www.overstock.com/Home-Garden/Safavieh-Handmade-Moroccan-Chatham-Grey-Wool-Runner-Rug-2-3-x-9/8090955/product.html?refccid=7QVVBDYRTB6IH7CK3I2ZHGPJZU& searchidx=175 3. http://www.overstock.com/Home-Garden/Safavieh-Handmade-Wyndham-Beige-Blue-Wool-Rug-23-x-11/8075726/product.html?refccid=E62VLEH4G7BLZTSL4SLYZVIKOA&searchidx=278 I hope I've helped and not confused you any futher :) Feel free to contact me if you have any questions. Good luck! 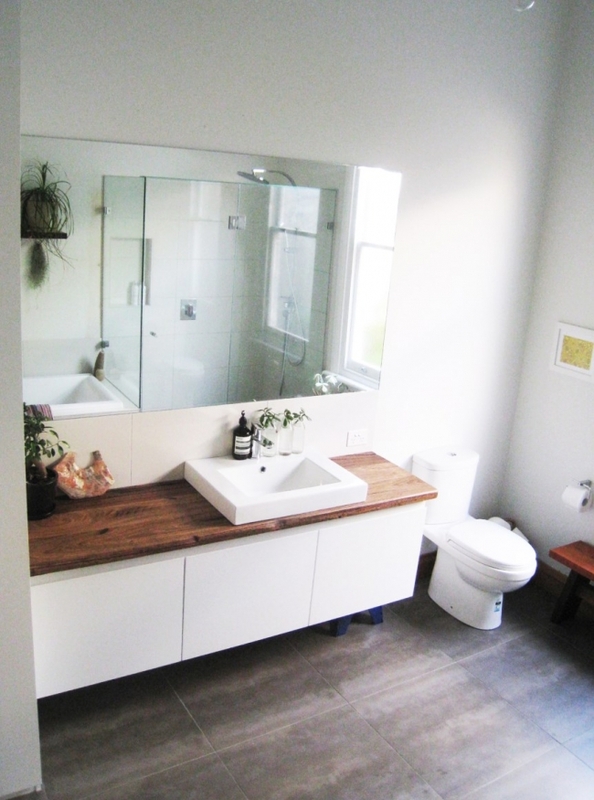 seriously loving their bathroom and wish i could justify the time and $$ to rip mine out now! i love both those runners - they would keep the floor a bit cosier underfoot in the cooler weather too(perhaps you could roll them up in the summer months?). so that's nto suggestions, just envy. thank you for sharing another beautiful reno with us. How gorgeous is the bathroom? We are renovating our second bathroom now and JUST finally decided on finishes.... Michelle's makes me want to reconsider what we chose! Wish I was in Melbourne so I could photograph and share her whole house! LOVE West Elm! 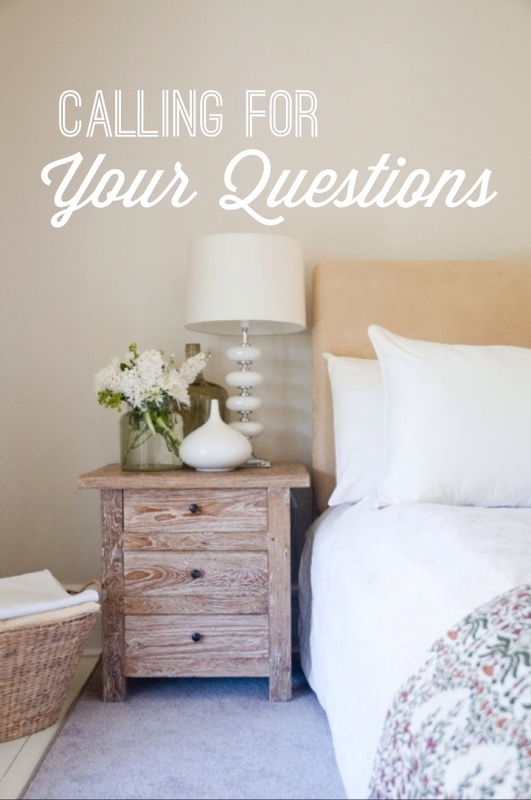 I recently bought their grey Ikat runner for my daughter's room and love it. It's the Ikat Links Wool runner in Frost. West Elm do stuff that is a bit different and their prices are good. Lovely bathroom by the way! I am loving plants in a bathroom. Me too! Nice buy. I'm a sucker for anything West Elm too. Although Maya is trying to distract me with her beautiful rug suggestions, I agree that no rug is best. 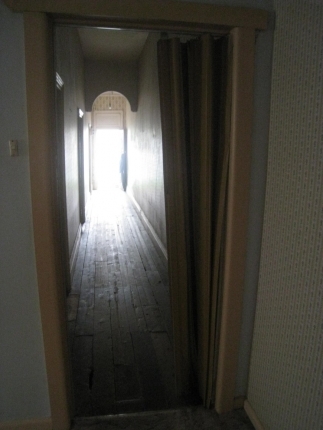 The hallway too narrow to accommodate a rug without covering all those lovely boards. I'd go for more life on the walls instead. Thank you for your suggestion Johanne! You and Nelly make a great point about covering up the lovely wood grain... I am now wondering if a dado rail effect would also work in the hall, with the bottom part painted a deeper colour than the wall. We don't have any rugs in our house any more, but sadly not because we have beautiful polished timber floors, but because Mr Nerd has asthma and I am the world's laziest vacuumer. I think a runner accompanied by http://www.lukejerram.com glass work hanging from the ceiling lit up by LED lights would be my kind of amazing. I love Luke Jerram! I would very happily have one of his glass pieces in my home... and his Maya sculpture is also awesome. Although I love the floor boards I know how noisy they can be especially with little feet running up and down them. I have some great runners at great prices, they are 100% premium wool, hand knotted and reversible and are available in 3m and 4m lengths. Or another option is to go for 100% sisal. Hardwearing, natural fibre and 4m long. I am trying to work out how to attach a photo to this post. Thank you Janette! The runners sound lovely and I love sisal too. l Unfortunately I don't have the option yet for JPEGs to be attached to comments but my web guy IS actually working on it this week! What a great home, I love all the period features. I really like the boards as they are! A runner could add some texture to the area though - Zanui have a pretty good range of runners, so worth a look there (zanui.com.au). 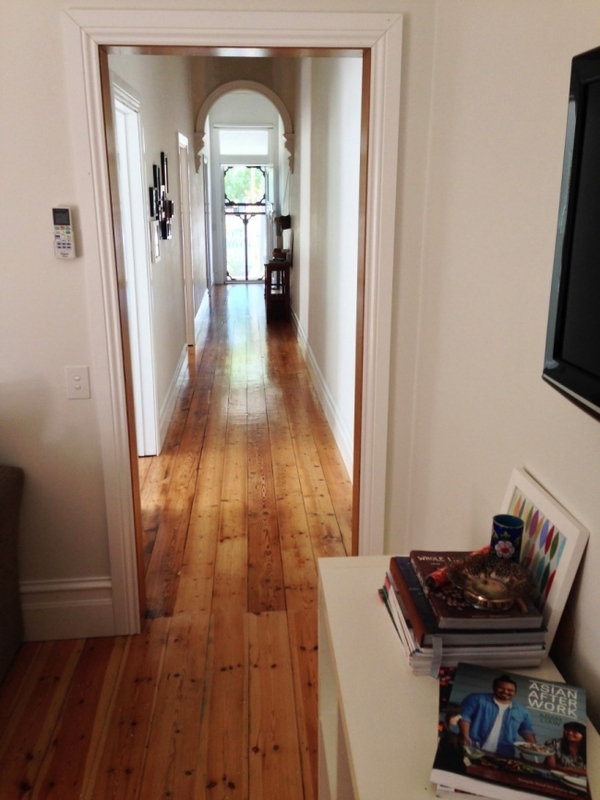 A statement pendant light or two would really look amazing in such a long hallway as well. Ah, great suggestion! I feel a bit behind the times as I have only just come across Zanui very recently - LOVE their wares! And totally agree with the statement pendant light too. Thanks everyone for your suggestions and advice, its given me a whole new perspective on the space - I love the idea of having artworks, and think it would be a great effect with the super high ceilings too! Janet light you have hit the nail on the head those little feet plodding down the passage way at 6 am - what a joy! Im loving the sisal but struggling to find the 10 meters I need to cover the space !